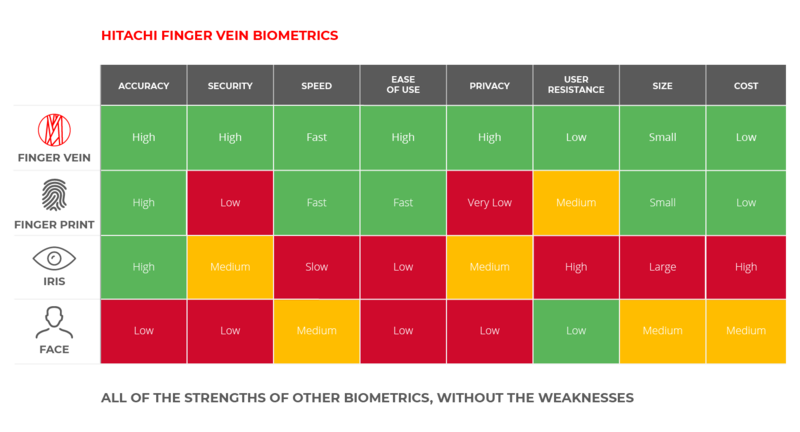 Finger vein technology is a safe, reliable, non-invasive biometric solution which provides fast and highly accurate identity authentication for access to data or secure areas. Users can now guard against illegitimate access or leakage of information on their computers by using the vein patterns in their fingers as their computer login. The combined package enables organisations to implement cost-effective identity management, giving users simple access to applications without the need for multiple passwords, and without compromising security. An easy-to-use, fast, accurate and system to record employees hours of working and site security. Suitable for organisations employing just a few people, up to large scale businesses – manages all your time & attendance and security and software requirements in one integrated security management system. Adding biometric identification to a smart card solution enables proof that the identity of the card holder matches the unique finger Vein template of that person. This strengthens access control security by requiring two-factor authentication. Allowing identification of who is entering rooms within the building and to control access to computers and files is an essential element for all financial institutions. Role based control — a policy based on job title. Time based – Temporary access provided, and Shift patterns can be incorporated to ensure staff can only access during their shift. We can create a solution to meet your needs whether it is 1:1 or 1:N matching.